It can be tough to keep business and working life separate when you run your own business, especially if you work from home. Even if you have an office to go to every day, setting boundaries so your work doesn’t start to take over your personal life is vital. Set yourself a time to be in the office each day and a time to leave, and stick to it. Even if you work from home, it’s important for you to feel like you’re going to work each day and entering a separate headspace. Don’t use the fact that you’re saving time on your commute as an excuse to stay in bed longer – stay disciplined so the boundaries between work and leisure don’t get blurred. If you have the option, try basing your working hours around your peak productive time. If you have more energy, motivation and concentration at a specific time, do your work then. You’ll get more done, meaning you’ll be less stressed about work when you’re spending time with your family or whatever you like to do in your down time. In today’s digital age, it’s easy to take our work home with us. We can receive emails at every hour of the day, which makes it hard to say no to taking on extra tasks that, realistically, can wait until tomorrow. Commit to turning off your notifications from work when you finish the workday. Another way to help separate your work life and your personal life is to have a dedicated space just for work in your home. It’s a place that you can leave and close the door on every night, and helps maintain the ritual of arriving at work every morning ready to deal with business. This doesn’t mean putting on a suit, but at least get out of your pyjamas! It will transform your attitude to the day ahead. If you’re working from home, it’s easy to think ‘I’ll just put the washing in,’ or ‘I’ll just take a quick trip to the supermarket’ between work tasks. Be strict with yourself and save errands for the end of the workday. If you regularly work late into the night, which is easy to do when your desk is so close to your bedroom, this could be a sign that you’re actually being unproductive. Parkinson’s Law is a popular productivity theory which states that “Work expands so as to fill the time available for its completion.” We all feel busy at college or work, but for some reason, if something urgent crops up, we usually manage to find the time to do that too. Expending more energy over a shorter period of time prevents the work from expanding to fill the amount of time you have available for it. 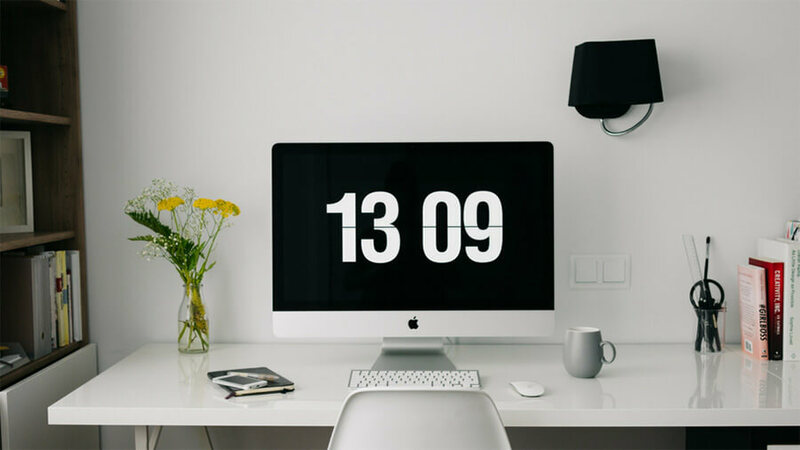 Stop multitasking, prioritise, set yourself deadlines throughout the day and be more ruthless about being distracted by things like emails and adhoc tasks. In a working capacity, most sources claim that people can generally concentrate in blocks of 45 minutes, where it is then advised to take a ten to fifteen minute break. Get up and grab a cup of tea, take a walk round the block (very important if you don’t have another reason to leave the house that day) or simply look at something other than the task at hand. This may seem like a cop out but it will guarantee that you get more done in those 45 minutes than if you were to power through hours of work, completely exhausting your brain. If you find it difficult working from home because you just cannot free yourself from distractions, a co-working space can be a reasonably affordable option. You get an office to go to every day, co-workers in the form of likeminded business owners, and a place that you can separate from your personal life much more easily.